When it comes to vehicles and their owners, Southern California has the most diverse car culture in the world. In stark contract to the changing waves of ideologies towards cars - in this Mediterranean-like climate, the car designs that are dreamed up give birth to hot-rods, sports cars, low riders and custom cars. With little humidity and therefore no rust, these beauties can end up living forever. For those in the know in Los Angeles area, the Petersen's Automotive Museum is a car mecca that attracts automotive aficionados from all over the world. Founded in 1994, the Petersen Museum has recently transformed its exterior, interior, as well as, the content itself into a topnotch automotive art museum. 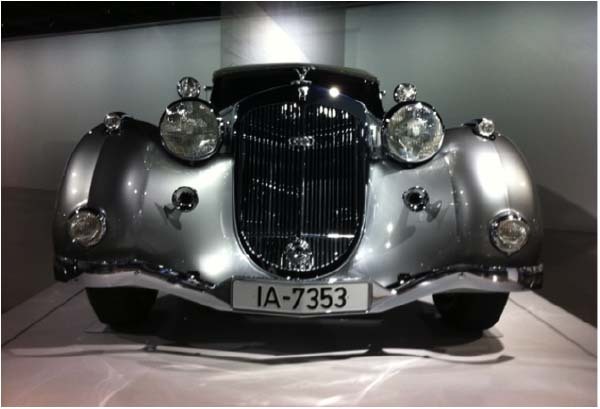 The museum exhibits a century of exotic cars and everyday favorites. From movie prop cars, commercial automotive renderings, car art and artists' treatment of the topic of art culture. 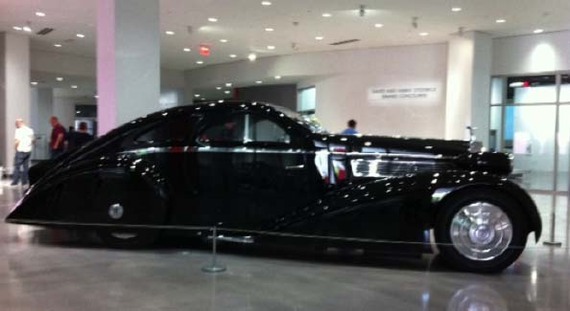 Just as expected from any top-tier automotive museum, one is greeted by an overwhelming masterpiece in the entrance - a 1925 customized Rolls Royce Phantom I Aerodynamic Coup. This beast so big, that it is a challenge to capture it with a camera. The curation and exhibiting of automobiles provides ample space to enjoy and photograph them from all angles, while the lighting presents the cars' gorgeous proportions, surfaces and details to their utmost advantage. The lighting, with its spotlight on the 'Ladies', makes it easy to get great shots and to fade the surrounding crowd of spectators into background silhouettes. Visitors can get up close to these exhibited beauties and enjoy the intricate features of these exquisite pieces of jewel-like art on wheels. With each vehicle on its own mobile platform, exhibits can easily be changed and new special exhibitions created, such as the 'BMW Art Cars. The museum is unlikely to run out of car stories to tell any time soon. It's huge vault of cars, together with its global connections, ensure that the visitor experience is almost always a novel one. What might surprise returning visitors are the exhibited commercial automotive renderings as well as, a live car design studio, occupied by actual automotive students from Art Center College of Design, the worlds leading automotive design school. As in any good state-of-the art museum, the experience of the exhibited creations is augmented by video presentations, interactive iPads and supported by a range of relevant paraphernalia and the museum store is well stocked with books, model cars, t-shirts and souvenirs. At the end of the day, after enjoying the automotive eye candy collected from across the globe, one is left with the feeling that this museum is somehow different and really quite interactive for the visitors. Having visited hundred of museums across the world, I can feel the warmth and authenticity of the audience at the Petersen's Automotive Museum. Fathers with more tattoos than hair, enthusiastically tell their sons and daughters about the cars as they photograph them and people from all walks of life gather here in the hopes of sharing their enduring passion for cars with those they love.